Bon island (or Koh Bon) is located just south of Rawai Beach in Phuket and is just a short longtail boat ride away. A few sandy beaches pepper the coast of this tiny island, and despite being so close to Phuket, it hasn’t been invaded yet. There are only two real beaches on Koh Bon (In Thai, islands are ‘Koh’). One was the landing spot of the now closed Evason Resort Phuket, and the other is the hideaway restaurant of ‘Dawn’ a now well-known English lady who made Phuket her home more than two decades ago. The island of Bon is not as impressive as Coral Island or Similan island, but it is so close to Phuket island, it’s a fun escape for lunch. With thatched roofs and a wooden restaurant, it has a little ‘castaway’ feel to it. 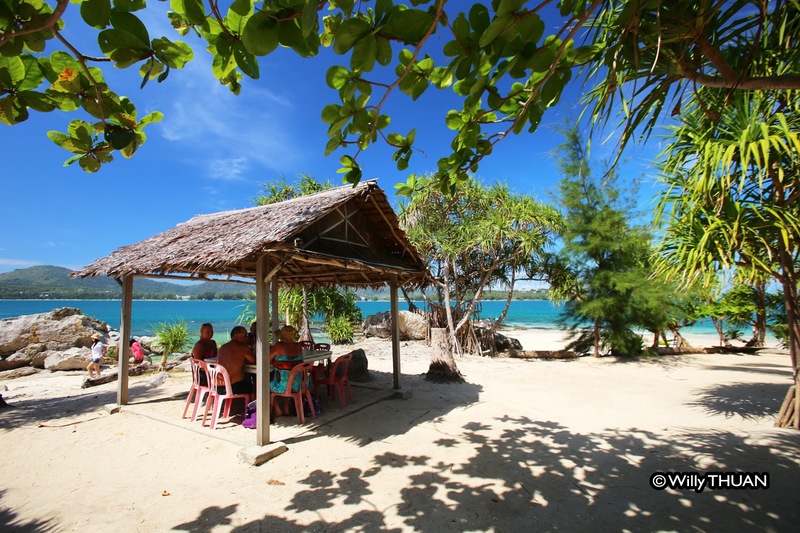 Of course you won’t be alone on Koh Bon during the high season as no restaurant would survive with just a couple of guests. Just like some other travelers in search of a hidden spot will land here for lunch, often repeaters who fell in love with the place, plus a couple of speedboats stopping over for lunch on their way to some other Phuket attractions. Once those speedboats are gone the beach is yours to play with: snorkeling, kayaking or just hang here watching yachts and sailing boats passing by with a local beer or a freshly opened coconut in hand. Apparently Dawn lives a life most of us would see as heaven on earth: a small white sandy beach with palm trees swaying in the summer breeze and little clouds gently drifting in an intense blue sky. Living in a Phuket postcard. Everyday, enough customers make the effort of crossing the sea to enjoy her legendary pepper prawns (280 baht) or Tamarin prawns (also 280 Baht) and all seems to be idyllic and perfect. But these are the good days, the life of an islander running a restaurant is not all fun and sun as Phuket does have a monsoon with nasty winds and heavy rains. Every single day she must bring everything back as no stock can stay on the island at night. The best way to get to Bon Island is to ride one of the longtail boats always standing-by on Rawai Beach. You just have to agree the price which usually starts at 1,000 Baht per person for a round trip and decreases with the amount of passengers. Note that you just pay the boat fare on the way back. Note that during low season it is recommended to check it the restaurant is open as weather sometimes doesn’t allow boats to cross. You can call 081 892 1156 or check directly on their Facebook page.